The Processing Area information is displayed when the Processing Area is selected in the 3D View. When the Processing Area is defined before step 2. Point Cloud and Mesh is processed, it affects the Point Cloud visualized in the 3D View of the rayCloud, the Volumes View and the results saved on disk. This Processing Area will also affect the results of step 3. DSM, Orthomosaic and Index. When the Processing Area is defined after step 2. Point Cloud and Mesh is completed, it only affects the Point Cloud visualized in the 3D View of the rayCloud, the Volumes View but not the results saved on disk. This Processing Area will also affect the results of step 3. DSM, Orthomosaic and Index. When exporting the Point Cloud, it is possible to take into account the Processing Area, even if it is drawn after step 2 is processed. For more information about how to export the Point Cloud: How to export the Point Cloud. In order to take the Processing Area into account for the visualization of the Point Cloud and / or the generation of the outputs of step 2. Point Cloud and Mesh, the corresponding filter should be selected in the Processing Options. For more information: Menu Process > Processing Options... > 2. Point Cloud and Mesh > Advanced. The Processing Area will be taken into account for the results of step 3. 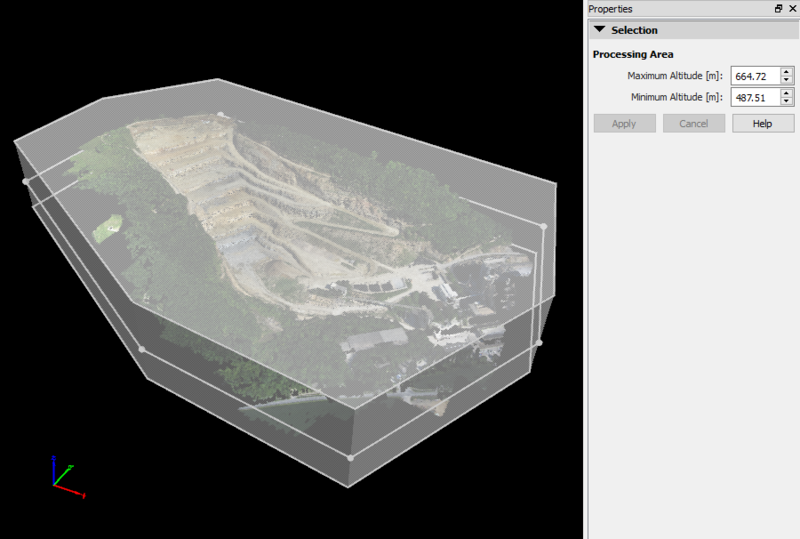 DSM, Orthomosaic and Index even if the Processing Areas box is not selected in the Point Cloud Filters. Note: For step by step instructions about how to select a Processing Area: How to select / draw the Processing Area. Maximum Altitude [units]: Altitude of the top plane of the Processing Area. Minimum Altitude [units]: Altitude of the bottom plane of the Processing Area. Important: Maximum Altitude should be higher than Minimum Altitude. Clicking Page Up/Page Down keys: Increase/Decrease the value by 10 units. Clicking Up Arrow/Down Arrow keys: Increase/Decrease the value by 1 unit. Clicking Up Arrow/Down Arrow text box buttons: Increase/Decrease the value by 1 unit. Typing a new number in the text box. Below that information there are 2 buttons, grayed out by default, enabled once the values for Minimum or Maximum Altitude are modified. Apply: Saves the new values for the Minimum/Maximum Altitude and applies the new filters. Cancel: Does not save the new values for the Minimum/Maximum Altitude.